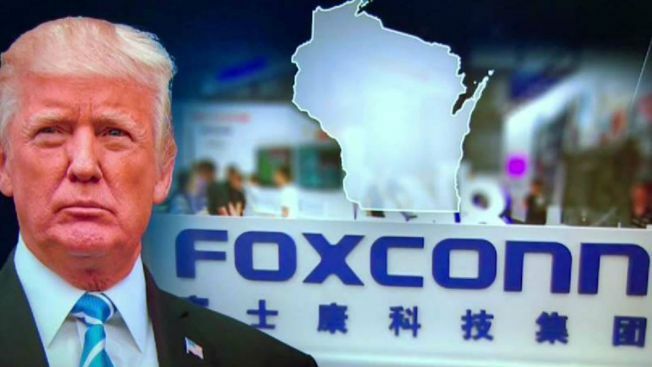 President Donald Trump came to Wisconsin touting thousands of new jobs at a Foxxconn plant, but he also faced tough questions about whether a new trade war is forcing Harley Davidson to move jobs overseas. NBC 5's Mary Ann Ahern reports. President Donald Trump joined officials in Wisconsin Thursday to break ground on a multi-billion dollar factory he said will be "the eighth wonder of the world." "We’re reclaiming our country’s proud manufacturing legacy," Trump said during a speech after touring the grounds. "That’s why it’s so important we open up our steel mills again. We need that for purposes of defense, purposes of legacy. We’re restoring America’s industrial might. And thanks to the hard-working patriots like you, we’re making America greater than ever before." The factory, opened by Taiwan-based company Foxconn, best known for assembling iPhones, will be constructed in Mount Pleasant, just north of the Illinois border. "I hope some of people working here will come from Illinois, because at 2.8 percent unemployment, we need people from Illinois, from Minnesota, all across the Midwest, to help us fill the jobs that are open," said Wisconsin Gov. Scott Walker. Trump arrived in Milwaukee overnight and was scheduled to attend the groundbreaking ceremony with Walker, House Speaker Paul Ryan and Foxconn executives. Located in Racine County, the factory is slated to open in 2020 and is expected to be massive, meant to produce LCD screens for televisions and computers. "Today’s groundbreaking is only part of the exciting story that’s playing out all across our nation," he said. The plant will potentially bring 13,000 jobs to the area, the company said, motivating local residents and businesses. Trump said more jobs could be possible with the facility. State and local governments committed $4.5 billion in tax incentives for the factory, and those who do not support the use of taxpayer funds for Foxconn were reportedly planning to protest the groundbreaking. Dozens of protesters blocked streets and rallied outside the Pfister Hotel during Trump's visit, NBC Milwaukee affiliate TMJ4 reported. Some were upset with “siphoning Lake Michigan water, seizing private property and misuse of public funds," others held signs that read "hate never made any nation great" and "my family, my world." A recent poll by Marquette University Law School showed skepticism growing among Wisconsin voters over the Foxconn deal with 46 percent of respondents saying they believe the incentive package isn’t worth it. Forty percent said they believed the aid would pay off.